The journey of IAYP in G.I.C. Matiyali (Garhwal, Uttrakhand) is a truly unforgettable experience which I will always cherish very fondly indeed. This exciting experience started when I was introduced to Skand Bali (Head, National Training Panel), with whom I had a dialogue on the IAYP. The journey of IAYP in a Government School - particularly one in the hills - was tough but I was ready to walk the path. With some determined efforts and with the help of Anand Mandhian (Award Leader, Doon School, Dehra Dun) I managed the IAYP training of our students at Kotdwar, where Mr. Bali and Mr. Mandhian motivated our students, telling them that by opting for the IAYP Programme they were going to create a page in the history of Uttarakhand Govt. Schools. The words uttered by Mr. Bali at the training inspired my students and they felt that by opting for IAYP they would achieve something extraordinary ... just a little extra... In the month of February 2012 our students started the Bronze Level, with four sections. Initially, they were slightly hesitant, but J.C. Bameta, R.S. Tomar, Ramesh Kukreti, K.K. Joshi, B.B. Binjola (all teachers in school) helped them to prepare for different sections of the Programme. K.S. Bisht encouraged them to learn Art, Mr. Bameta helped them to learn music & R.S. 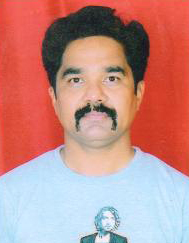 Tomar motivated the students to take active part in Sports. For the Skill section they developed Saura Painting and skills of music. Ramesh Kukreti helped them to give useful Service in the school and the community.The service was not confined to school - the students also helped in Polio Booths, cleanliness of the local market, teaching the junior classes, cleaning the classrooms, planting trees and in this way they were learning the finer values of life. In Physical Recreation they had regular training exercises, developed strength, flexibility and concentration. My colleagues in the school were monitoring & evaluating the progress and proficiency of the participants in different areas. As a programme leader I was happy to see the students' creative potentials were being enriched through service, skills and physical recreation. Next, I planned an Adventurous Journey with my colleagues and decided to visit Bhelda and Bhadalikhal. On the morning of 15th July we gathered at school, excited and armed with food and snacks. It was an 8 km journey through a forested area with many kinds of trees. We covered the route in two hours. The IAYP participants were delighted when they crossed a small river. Through experiential learning, the students learnt first-hand and got a very clear picture of what a jungle is. At the primary school in Bhelda we sat under a tree, while the participants prepared tea and had the food that they carried. We had an interactive session, discussing the problems of the inhabitants. Now it was time to return and as we started back, I was preoccupied by thoughts of the reports to be written in the IAYP Diaries. In December 2012 we were informed that the students of G.I.C. Matiyali have qualified for the Bronze Award. We were perhaps the first government school in Uttarakhand to accomplish the IAYP programme! I wish to acknowledge my gratitude to my staff members for their assistance in IAYP. Thanks are also due to R.K. Kukreti, B.B. Binjola, J.C. Bameta, K.K. Joshi, R.S. Tomar, Dr. C.S. Negi, and Dharmendra Negi Co-ordinator B.R.C. Kotdwar for their co-operation. A special thank you to Skand Bali & Anand Mandhian to whom I turned for advice. "Climb the mountains & get their new tidings. Nature's peace will flow into you as sunshine flows into trees, the winds will blow their own freshness into you and the storms their energy, while cares will drop away from you like the leaves of autumn." Receiving the Silver Award of the IAYP programme was indeed a great moment for me and it inspired me to aspire for the prestigious Gold Award. My Gold Award journey began with an exciting and adventurous river rafting trip that provided a wonderful opportunity to enjoy the refreshing rapids of Hattihole River in North Kodagu. The 50 km journey by bus with other gold and silver aspirants was filled with excitement and the anticipation of savouring nature's rich bounty. Initially, the instructors briefed us about the techniques of rafting and safety measures to be taken in times of emergency. Then we were divided into groups for the preliminary practice sessions that infused us with confidence. Well-equipped with skill and vigour, we boarded the rafts with life jackets on, to take on the delightful rapids this river had in store for us. Each raft had a lifeguard who guided us through our journey on the river. It was a joyous experience for us as we felt nature's abundance in the river. Dotted with rocks, plants, thickets and trees, and surrounded by lush green coffee estates, the river provided a feast for our eyes. It was indeed a challenging task for us to row our rafts against the water currents while keeping at bay the hurdles that came our way. The most enthralling part was when we faced two rapids that tossed us up and down and we were showered with sprays of water. We experienced the joy to the core but at the same time had the presence of mind to stay intact on our raft. Unfortunately, at one point our raft got stuck under the branch of a tree. This was indeed a challenge for all of us but since we were mentally prepared for such situations we acted promptly. It was the combined efforts of my teammates and guidance of the lifeguard that saved us from danger. This incident made our rafting experience even more exciting and adventurous. Besides, it taught us a valuable lesson of life that one should not panic in the face of danger; instead use one's presence of mind to ease the situation. We also realized the strength in teamwork. It was on the whole an awesome experience which unraveled the sensational beauty of nature and added to my store of knowledge gained through the various treks, nature camps and river rafting experiences I had in different places earlier. I must admit that each time I have gained a unique experience and it has deepened my respect for nature. True to the adage, "Nature is the window through which we see heaven" I experienced an exceptional sense of joy along with my companions and I firmly believe "The purpose of life is to live it, taste it, experience the utmost & reach out eagerly and without fear for newer and richer experiences." I am grateful to my school for organising such meaningful activities. I also thank IAYP Award leader Ms. Teena Machaiah for encouraging us to participate in such activities. I, along with the other Awardees, am immensely proud to completing the Award journey and receive the Gold Award from Padma Shri Hari Dang and the National Director Kapil Bhalla. The Award gave me an opportunity to engage and acquire new skills first hand through participation in the four sections. I got the liberty to design my own programme and to set my own goals by challenging my boundaries. The most powerful impact the Award has had on me is my increased participation in civic life through my increased involvement in volunteering and community outreach activities. The National Award Ceremony was a big platform for me to interact with many other Gold Awardees from various schools, backgrounds, abilities and circumstances, which made me realise how we all in spite of our differences are the same and how we all enjoyed the last few years doing the Award. I want to take this opportunity to thank my Principal, Dr. Neeta Bali and the Award Coordinator for supporting, guiding and giving me the opportunity to engage myself in this moral enhancement of an activity. I also wish to thank the National Award Authority Team for organising the GOLD AWARD ceremony and making it very special for all the Awardees. The annual Gold Award Ceremony was organised by the National Award Authority on 12th July 2013 at the India International Centre, New Delhi. The function started on an exuberant note with a music performance by the band (which included Award participants) from G D Goenka World School, Gurgaon. Presiding over the ceremony were the Chief Guest Hari Dang (Padma Shri), Himmat Kalsia (Chairman, Award Programme Foundation) and Sanat Kaul (Managing Trustee, Award Programme Foundation). Kapil Bhalla (National Director) welcomed the Gold Awardees’ and guests and presented a report on the progress of IAYP India. He encouraged the Gold Awardees to continue their association with the Award by volunteering and participating in Award events. 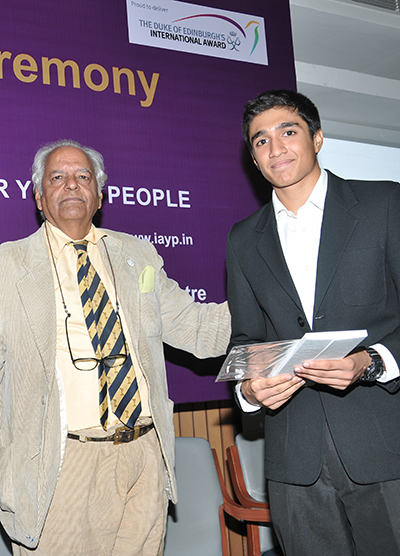 The Chief Guest, Hari Dang gave an inspirational speech describing his own Award experiences. He gave a glimpse of his impressions as one of the key member of the core team that introduced the Award in India in 1962 at The Doon School, Dehradun. He motivated the Gold Awardees, telling them that they were now equipped to respond to the expectations of society and they should work towards the betterment of society. After his speech, 78 Award Participants were awarded the Gold Award. Along with this 18 Award Leaders and Volunteers too were rewarded with a Meritorious Certificate of Recognition for their ‘Special, Valuable and Outstanding’ services to the Award in India. The Chief Guest and the National Director interacted with the Awardees who came up to the stage. A small token of appreciation was also given to the Volunteers who helped organising this big event. The ceremony concluded with a few words of thanks and appreciation by the Chairman, Himmat Kalsia. 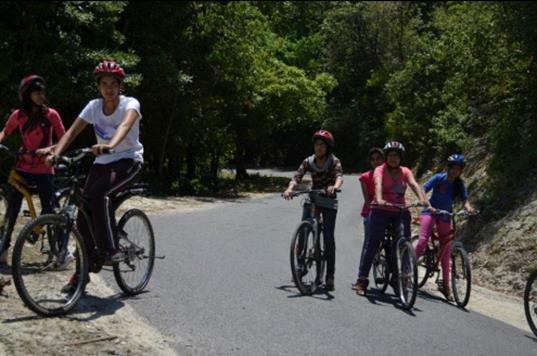 An Adventurous Journey was organised for the Award participants of Uttam School for Girls, from 8th to 11th May 2013. This 3 nights, 4 days programme was organized at Camp Vanvas, Mukteshwar. The camp was situated in the jungle, at a height of 7500 feet above sea level, surrounded by mountains, waterfalls, wildlife and dense forests of silvery fir, shaped like pyramids. This journey was a mixture of wildlife, fun, adventure and learning. The trip gave us a chance to understand mountain life and the value of the environment. Activities such as Treasure Hunt, Mission Impossible, Pressure Bombs, Spider Web and Friendship Ladder were organised as icebreakers for the participants to get comfortable with each other and to encourage team work. These activities also taught the students that participation and team work are more important than winning. Other activities such as Rappelling, Swimming, Cliff Jumping, River Crossing and Mountain Bicycling helped the students to be enthusiastic and brave and to prepare them to face obstacles in life with courage. Also for many, it helped in overcoming a phobia of heights. For the first time all of us felt free, with no restrictions and faced our fears bravely. A visit to the village was organised with the aim of conservation and promotion of sustainable eco-tourism in the Himalayan Region. It also provided the students an opportunity to get involved in various household activities and visit different locations of the Kumaon region to see and experience the great outdoors in real life. All the activities were a real learning which not only helped in strengthening their team spirit but also helped in building their personality. Uttam School students will be eagerly looking forward to such excursions in future. Rome was not built in a day! Neither was my Award journey from Bronze to Gold! I started my Award journey when I was in grade 8, and today when I am about to complete the 12th, I have attained the Gold Award. I was initiated into the Award by chance - thanks to the teachers who introduced me to it. My school was taking a group of students for an adventure trip. I have always had a passion for adventure, and just because of that I enrolled for the trip. And two days prior to the trip, I was given a 'Record Book' and a 'Diary'. At that time, I didn't have a clue about the IAYP Programme and what it involved. My teachers explained the process and the benefits of the Award, and I found myself very attracted to the Programme. What really grabbed my attention was that it's not a competitive award! With a full sense of responsibility and an aim to develop myself and turn into a person of substance, I set off on my Award journey. To start the Bronze Award, the first thing I did was to go on my Adventurous Journey. I went to Shivpuri, Uttarakhand, where I did trekking and swimming in the Ganges (which the locals called, "Ganga Panga"!). Once I returned to school, I realized the Award demanded daily work, but all I did in mind was to turn myself from nothing to something. For my Service section, I worked for the school magazine, to serve the school. During that time, I had just picked up a new sport, Skating, which became my daily Physical Recreation. I was hesitant to speak in public, so I took the opportunity to overcome my fear, develop my Skill and gain confidence. From April to October, I gradually improved in all fields. And it was at the end of October, that I received my Bronze Award from the IAYP National Director. I started with my Silver Award as soon as I turned 15. This time also, it was adventure that I started with. But this Adventurous Journey gave me many more experiences than the previous one. The trip this time involved a special training course at NIM, Uttarkashi. This time I thought of changing my Service and Skill. From school level to now I wanted to help people who actually required help. I joined the Cheshire Home, where over a period of a year, I went once a week to help the differently-abled people. It was then I actually went out of my comfort zone to help. At first it was like a nightmare - I couldn't sleep the night I saw them for the first time. But gradually I overcame that fear and very soon they became my new friends. For my Skill section, I did movie-making, my second passion. During that time, I participated in an international film festival, where my movie stood fourth. I continued with Skating, and participated in the State level competition. It was March 29th, 2012, when I received my Silver Award from Mr. John May, Secretary General, International Award Foundation. Now, it was the Gold Award to be achieved, with another year of hard work! I changed my school during that time, but the efforts that I had already put in toward my Gold didn't get wasted. As soon as I came to the new school, I started working for my Gold on the very first day. I changed all my activities: from skating my Physical Recreation became hockey; Service this time was to clean the campus and protect the environment; and I took my passion for public speaking to a new level, with MUN. And for Adventure, I was the student leader! My only concern was the Residential Project. My father came as my saviour, he wanted me to completely experience the world I had never even given a thought to. I was sent to a place near my hometown, Lalitpur, where I stayed and worked with labourers to build a kindergarten school. IAYP has changed me into a completely different human being. I have actually achieved all my targets. IAYP has given me a platform to develop my passions, and made me excel at it.